Macabre Tales is a Lovecraftian pulp horror role-playing game, geared for one-shot adventures for one player and a narrator. From the retro-pulp cover to the story-driven rules to the discussions of theme and mood in Lovecraft’s stories, the whole game looks and feels like a loving tribute to a favorite author. The game mechanic involves two sets of double-six dominoes with a few pieces removed. The player keeps these as a pool to draw from during the game, and draws three face up as a hand. When an action requires a check, the narrator assigns a challenge level, then tells the player which stat (and possibly which aspect) will be necessary to complete the task. The player then plays a domino that they hope will cover the challenge rating. The outcome is based on the level of their stat, which determines which end of the domino is read (low, high, or both), and the aspect is added for a result that should meet or beat the challenge rating. Doubles and blanks get special treatment, but I’d rather not spoil all of the details of the mechanics – it’s simple and elegant, and I would love to see it become the engine for other RPGs in the future. In lieu of traditional take-turns-bashing combat rules, Macabre Tales uses Tension Scenes, in which the player gains and loses Momentum Points that determine how well (or poorly) things are going for them, with the Momentum Point goal getting higher as the story develops. The player is rewarded with Genre Points for appropriate actions, cleverness, and evocative narration, which can be used to help them in future checks. It’s a solid story-driven rule system. Included are a list of sample supporting characters, stats for most of the well-known Lovecraft creatures (Deep Ones, Mi-Go, Shoggoths, et al), a list of abilities to create your own horrors, and a sample adventure, “The Cursed House.” Macabre Tales is not only an excellent Lovecraft RPG, it’s a great resource for how to run any Lovecraftian horror game, with tips and analysis of the themes, mood, and settings of his stories. I often wonder, when reading, running, or playing an RPG based on the works of an author, what that author would think about how gamers are treating their creation. 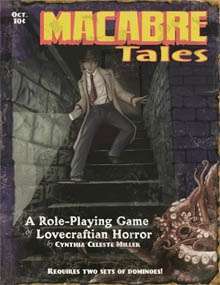 Reading through Macabre Tales, I get the feeling that is the RPG that Lovecraft would give his Elder Sign of approval. Now, if I can just find a few sets of Cthulhu Mythos themed dominoes, I’ll be a very happy cultist. Check out Macabre Tales at DriveThruRPG.